Renfrew’s cultural history education programs offer students a fun way to learn about farmlife in the 1800s. Unless otherwise noted, all programs are two hours long and the cost is $5/student. Groups may have between 15 and 30 children. There is no charge for accompanying adults. Young children are introduced to farmstead life of the early 1800s in this program, the first in a series about the Pennsylvania German culture of our region. Students learn that people of the past needed food, clothing and shelter, as well as a little fun—just like today! An instructor dressed in period clothing greets the children. After an introduction in the historic Royer smokehouse, the class moves to the yard of the Royer farmhouse. There they participate in a variety of hands-on activities, such as a dress-up station, a craft and a planting activity. Throughout the program the children learn nursery rhymes, which connect them to the activity at hand. The experience concludes with a story about life on an old-fashioned farm. Each child will take home a project created at Renfrew. Students learn how settlers made and used butter and other dairy goods to supply an important part of their diet. Through storytelling and first person interpretation, students meet Nancy Royer, a young woman who lived on this farm in the early 1800s. Nancy helps students step back in time as she questions their strange clothes and travel methods. Students visit the Royer milkhouse, churn cream into butter, and make samples to take home. Instructors dressed in period clothing help students compare and contrast life in the 1800s with modern life today. Kids learn how to make butter during the Dairy Culture program. Flax straw is scutched to remove the hard shell from the stems. Students are introduced to the four-square garden and its importance in the lives of the Pennsylvania Germans of the 1800s. They also learn the significance of the four-square garden design. Hands-on activities involve students in seasonal garden tasks (planting, watering, sorting, harvesting). Concepts in historic preservation, farmstead culture, folklore, plant biology, natural history, ecology, and environmental awareness are included. Instructors dressed in period clothing help students compare and contrast life in the 1800s with modern life today. 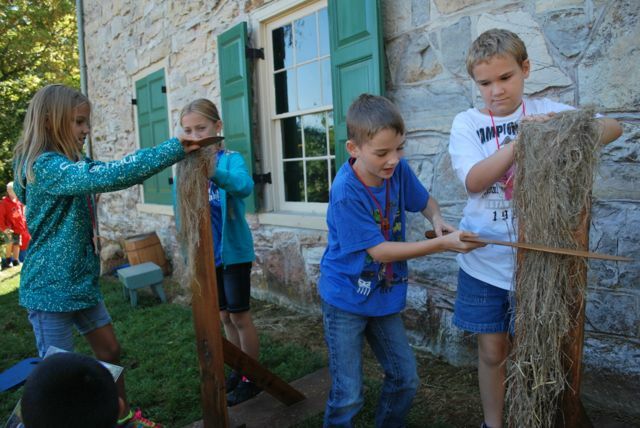 As a study in living history, students explore, through hands-on participation, how Pennsylvania Germans of the early 1800s worked wool and made it into cloth, and how they used this cloth to help meet their textile needs. Students wash and card the wool, spin it into yarn, and weave the yarn into cloth. They see firsthand how much work is involved in raising and creating their own clothes. Instructors dressed in period clothing help students compare and contrast life in the 1800s with modern life today. Underwriting support provided in part by Mary’s Delight Farm–Leonora Rocca Bernheisel. This program is designed around the growing and processing of flax and its historic importance to the farm families of this region. By working with flax on a first-hand basis, children are exposed to the concept that the people of the past met the demands of daily life by extracting energy from the local environment. Students process the flax from drying and breaking to scutching, hatcheling, spinning, and weaving. Instructors dressed in period clothing help students compare and contrast life in the 1800s with modern life today. Students learn how the Pennsylvania German settlers provisioned themselves for the winter. Offered in the fall season, the program uses hands-on activities to demonstrate basic methods of food preservation such as drying, pickling, candying, and cellaring. Within the context of food preservation, students learn about aspects of basic physical science, such as compounds, mixtures, acids, and bases. 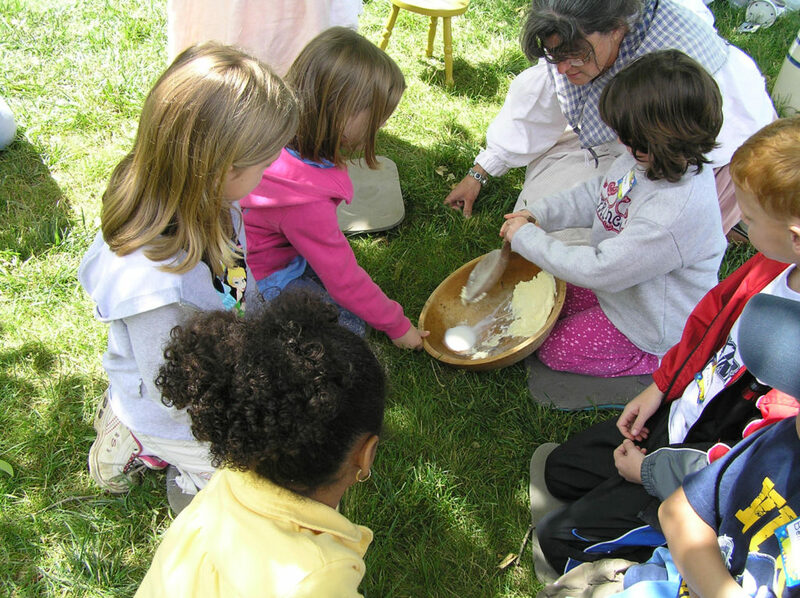 Hands-on activities are varied and may include grinding grain and “stomping kraut.” The concept of self-sufficiency is explained as students compare and contrast the technology of the early 1800s with that of today. Students gain awareness of their reliance on modern agricultural industry and practices to provide for nutritional needs, and learn of its economic importance in the region. A culmination of the Renfrew experience, this two-part program is designed for sixth grade students who are completing the sequence of elementary programs offered by Renfrew Institute. Students are taken into the Royer home (mansion house) where they learn how the Renfrew property became a gift to the community of Waynesboro. They enjoy a tour of the house and also participate in hands-on activities that demonstrate the behind-the-scenes work involved in museum operation. In the second segment, students take a walking tour of the Royer farm (Renfrew property) with an Institute instructor. The guide helps students pull together pieces of their past Renfrew experience into a deeper understanding of the Royer/Renfrew farmstead—past, present, and future. For more detailed information and a complete description of school programs and fees, contact Renfrew Institute by phone at (717) 762-0373 or by email at info@renfrewinstitute.org. 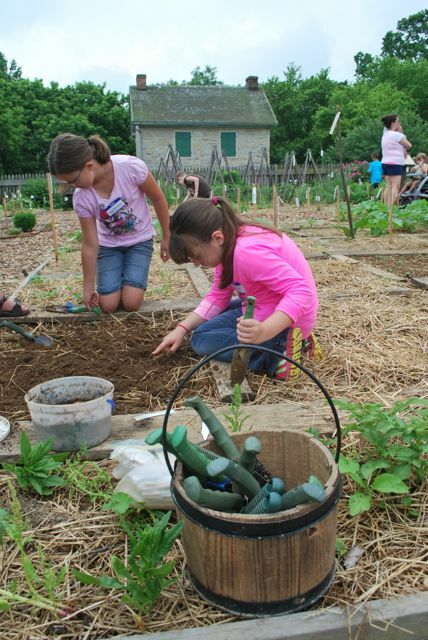 Students learn to plant and other garden tasks, as well as the history and culture of the Pennsylvania German 4-Square garden.